﻿ What's the Difference Between UHD and 4K? From the past until now, many TV manufacturers, broadcasters and technology blogs use the words UHD and 4K interchangeably. They always go together to describe the high definition videos about 4000 pixels. But is 4K and UHD the same thing? Many users think there is no big difference between 4K and UHD. Not even wrong, but precisely this thinking gives Ultra HD TVs a possibility to muddle through 4K TVs. Thus, it's quite essential to clarify the distinctions between 4K and UHD before the situation gets out of the control. 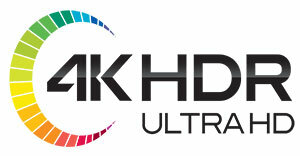 UHD vs 4K, What's the Difference? What's 4K? 4K, also called 4K resolution, refers to a horizontal screen display resolution in the order of 4096 × 2160 pixels (two times the pixels of 2048 × 1080 2K) and 1.85:1 aspect ratio. As you can see, the vertical resolution is more than 4000 pixels, while the standard not only refers resolution, but also stipulates the coding scheme. 4K streaming media in DCI union have to adopt the JPEG2000 compression, with up to 250Mbps bit rate, 12-bit color depth and 4:4:4 image quality. What's UHD? As for UHD, it is a display resolution of 3840 × 2160 pixels, four times as many pixels as 1080p FHD (Also see 4K UHD vs 1080p FHD) in the same 16:9 aspect ratio. And the majority of 4K UHD TVs or monitors we have see adopted the UHD resolution indeed. If you play 4K videos on the so-called 4K UHD monitors, there will be black bars on the left and right area. Even if there is no visual difference, but the real quality won't go same with the DCI 4K. Simply put, 4K is a professional production and cinema standard, while UHD is a consumer display and broadcast standard. Why 4K UHD, not 2016p? Well, it's impossible that TV manufacturers don't know the difference. But presumably for marketing reason that 4K is strictly requested, some TV makers seem to use the phrase 4K UHD or single 4K. 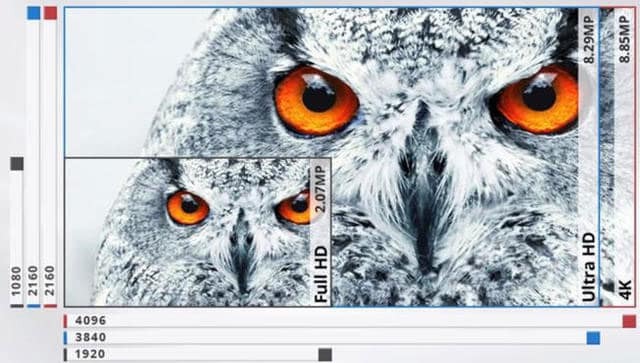 To make matters more confusing, the next generation ultra HD in 7680 × 4320 is also called UHD, more precisely, 8K UHD should be renamed in QUHD. So, to be reasonable, 4K should be abandoned by TV makers to get rip of misunderstanding. Instead, 2160p is more accurate. Usually, the resolution refers to horizontal resolution, which uses "i" or "p" to distinguish interlaced scanning and progressive scanning, such as 567i (PAL), 480I (NTSC), 576p (DVD), 720p, 1080p, 1080i etc. Yet it's easy to change the name from 4K to 2160p, if a big TV manufacturer adopts the name 2160p. For example, Samsung calls their standard displays "UHD TV", while LG, Sony, and Vizio name their standard 4K displays 4K Ultra HD TV. But the more important is where in the heck we can all get some real 4K content rather than the 3840 × 2160 pixels video to watch. What About 4K vs 4K HDR? HDR stands for high dynamic range, as its name implies, it's an image-based rendering technology to improve the image quality. Simply, if the HDR is applied in, the details of your picture will be more abundant, the color will go more exquisite and natural. 4K and 4K HDR are not equaled completely. Take the 4K UHD TV as an example, in early years, HDR is not required for 4K UHD TVs, and until now, some 4K TVs don't support HDR indeed. But all the HDR TVs have adopted the 4K or UHD screens. Are There A Lot of 4K Contents and HDR Contents? Most blockbuster movies moving forward to offer 4K Blu-ray discs, and UHD content on the web is still an considerable part of 4K contents. You can stream and even download 2160p UHD content from YouTube, Amazon, Vimeo, Netflix and so on. Certain high-profile 4K Netflix movies and shows include Death Note, House of Cards, Jessica Jones etc. When it comes to 4K HDR content, I have to say it's not at the moment. HDR content is still in a state of infancy, but both Amazon Instant Video and Netflix are working to incorporate more HDR videos. On Netflix, you already can watch the 4K HDR shows like Marco Polo and Daredevil. Besides, old movies can be remastered to support HDR as well. The latest news comes that Sony will make a updated of Uncharted 4: A Thief's End for HDR support. Can You Watch 4K or UHD Content on Mac and Windows? Yes. 4K TVs is the best choice for watching 4K content without any doubt. But sometimes you absolutely have no TVs or any monitors in 4K, but merely a desktop screen. Can you watch 4K content on Mac and Windows? Firstly, it demands a lot, from the internet connection, 4K video player to computer hardware configuration. Generally, to have smooth standard definition video, you're recommended to have an internet connection more than 2Mb/s. For 4K video streaming, the speed should be much higher, up to 15Mb/s. Media players like VLC, 5KPlayer, KMPlayer, DivX Player are all nice choices for watching 4K UHD resolution video on Mac and Windows. In case of computer configuration, the minimum hardware support for 4K video playback goes for an integrated graphics that support 4K external displays, such as 4th generation Intel® Core™ processor family and AMD A10-7800 APU. Then discrete graphics card is required as well, Nvidia GeForce and AMD Radeon™ HD 7000 Series or better are available for 4K playback. However, even if your computer meets all the requirements above, you may find that 4K video plays back choppy. It's all because of the immense processing power required to play 4K UHD. So you need to do some 4K video processing to make your 4K UHD acceptable for your computer. MacX Video Converter Pro enables you to do so through lowering the frame rate from 60fps to 30fps and even 24fps, reducing bitrate to 18Mbps, 12Mbps, adjusting the aspect ratio from 4:3 to 16:9, and even compressing 4K UHD to 1080p or 720p when 4K videos get stuck and absolutely won't play on your low profile desktop. What's the difference among 4K, 8K and 10K UHD?